The B.C. Lions and Edmonton Eskimos have new marquee quarterbacks, while the Calgary Stampeders are keeping their star pivot. Mike Reilly and Trevor Harris were both on the move, while Bo Levi Mitchell stayed put on a wild opening day of CFL free agency. The three quarterbacks were the top players available when the free-agent frenzy began Tuesday at noon EST. Reilly was the first of the big three to go, signing a four-year, $2.9-million benchmark deal (average annual value $725,000) with the B.C. Lions following six seasons with the Edmonton Eskimos. Reilly, 34, was the CFL's highest-paid player last season at over $500,000. The Kennewick, Wash., native is now closer to home and returns to the franchise he began his CFL career with in 2010. As stunning as Reilly's contract was, more surprising was the inclusion of the deal's value on the press release. Traditionally, CFL contracts don't include monetary details. What's more, B.C. signed Reilly to the big deal unsure what this year's salary cap will be. It was $5.2 million in 2018, but the league and its players must still negotiate this year's figure. The current collective bargaining agreement expires in May. Shortly after Reilly's deal, Harris signed a two-year contract with Edmonton reportedly worth $1.1 million. The 32-year-old established career highs with Ottawa last year in pass attempts (615), completions (431) and yards (5,116), then had a playoff-record six TD strikes in the East Division final before the Redblacks lost 27-16 to the Calgary Stampeders in the Grey Cup. Mitchell was the last to decide his future, accepting a four-year deal to remain in Calgary after reportedly also weighing offers from Toronto and Saskatchewan. The 28-year-old native of Katy, Texas is a stellar 69-15-2 since becoming the Stampeders' full-time starter in 2014 and has led the franchise to four Grey Cup appearances (winning two) and captured the CFL's outstanding player award twice (2016, '18). "Yeah, I think Mike, Trevor and I kind of knew it could be a whirlwind of teams and locations on where we landed," said Mitchell. "We'd all been talking, so it's kind of funny that way. We're looking forward to what can happen." Mitchell, who threw a CFL-high 35 TD passes last season, worked out for seven NFL teams this winter but never signed a contract. When asked if his deal was worth just under $3 million (there were reports of $2.8 million) for four years, Mitchell said, "If math serves correctly, that's correct. "It was a crazy morning. First time for myself ever being in free agency. Fielded offers from a lot of teams and had some very, very good offers out there. I told Calgary I'd give them last right of refusal and once I found the second offer that I liked the most, give them a chance to get close to it or beat it or whatnot, they did just that. "I gave Calgary the last chance and they got very close to where I wanted to be and where I thought I was very well paid, but we can still put a team together." The defending Grey Cup champions took some hits, though, losing all-star defensive tackle Micah Johnson (Saskatchewan), defensive back Tunde Adeleke (Hamilton) offensive lineman Spencer Wilson (Montreal) and receivers DaVaris Daniels (Edmonton) and Lemar Durant (B.C.). Wilson, Adeleke and Durant are Canadians. Another huge deal was Winnipeg agreeing to terms with defensive end Willie Jefferson. The former Saskatchewan Roughrider had a career-high 10 sacks with two interception return TDs and joins a unit anchored by linebacker Adam Bighill, the CFL's top defensive player last season. While he lost the most coveted player, Edmonton GM Brock Sunderland was a big winner Tuesday. Shortly after Reilly's official departure, Sunderland went on the offensive, adding Harris, receiver Greg Ellingson and offensive lineman SirVincent Rogers, all previously with the Redblacks, and Daniels. But Sunderland wasn't finished. He also bolstered his defence by signing Hamilton linebackers Don Unamba and Larry Dean, the East Division's top defensive player last season, and Winnipeg's Jovan Santos-Knox along with B.C. defensive back Anthony Orange. 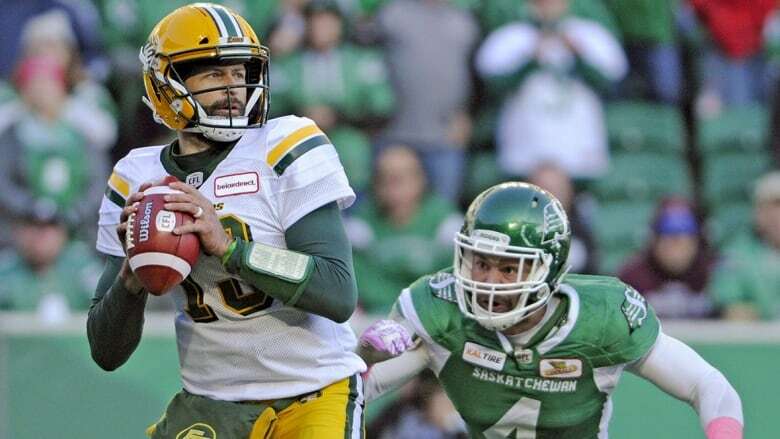 The Eskimos gave Reilly permission to speak to teams prior to Tuesday. Sunderland said he knew by last weekend Reilly was hitting the open market and that knowledge helped him. "Once it hit noon eastern, we knew who to start calling and what we were swinging for," he said. "Had we not had an indication over the weekend, it would've been very challenging." Adding so many players who are familiar with each other should help. Sunderland has first-hand knowledge of the former Ottawa players, having served as the Redblacks' assistant GM before coming to Edmonton. "Continuity is huge," he said. "Those guys know each other, obviously they have a good rapport ... I know what they're going to bring not only as football players but also character for the locker-room. "But you never know what's going to happen in free agency, it's the most unpredictable thing in sports. I didn't sleep hardly 30 minutes last night. We were hoping for a lot, we're happy with what we have so far and we're still working." Lions GM Ed Hervey also was busy Tuesday, adding Canadian offensive lineman Sukh Chungh, who spent the previous four seasons with Winnipeg, Durant — the top Canadian in last year's Grey Cup —and former Edmonton defensive back Aaron Grymes. "Edmonton making moves oh my goodness!" tweeted Riders free-agent defensive back Jovon Johnson. "Geez Trevor Harris to run that offense...The WEST is the BEST right now! If Sunderland and Hervey were the big winners Tuesday, Ottawa's Marcel Desjardins was the GM left with the most holes to fill. The Redblacks lost starters Harris, Rogers. Ellingson and running back William Powell, a two-time 1,000-yard rusher who signed with Saskatchewan. Desjardins told reporters in Ottawa the club believes backup quarterback Dominique Davis can become the club's starter. "At the end of the day with Trevor, it didn't work out," he said. "We're comfortable with Dominique Davis being our quarterback. "I can understand the frustration because these are popular players at key positions. I think we proved in the past we can find players that are able to play for us. We'll have a competitive team and one that's exciting to watch and in many cases we'll be a younger team, which isn't always a bad thing." Rogers took to Twitter to explain why he left. "I didn't like the structure of the 2nd year of Ottawa's last offer to me," he tweeted. "Respect is everything for me, and I felt that fading toward me in Ottawa." The Montreal Alouettes signing American defensive end John Bowman, their 36-year-old career sack leader, to a two-year deal. They also added fullback Christophe Normand (last year with Edmonton) and former B.C. linebacker Bo Lokombo, both Canadians, and American receiver DeVier Posey. Hamilton signed Canadian receiver Brian Jones, who split last year between Saskatchewan and Toronto. The Roughriders signed former B.C. linebacker DyShawn Davis on a one-year deal. They also re-signed quarterback Zach Collaros to a one-year contract. Winnipeg re-signed Canadian receiver Nic Demski to a two-year contract. Toronto signed running backs Chris Rainey and Canadian Mercer Timmis as well as American defensive back Chris Fogg.